• What is a Function? Basic Random Function to Color a Pixel. The random function accepts a range parameter and will produce a random value in that range. If only one parameter is given, it will produce a random value between 0-parameter. If two paramters are given, it will produce a value between those values. Noise values are a different way of producing random values that are more structured. 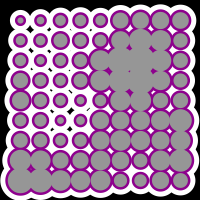 It's based on Ken Perlin's noise algorithm. You'll notice a repeating pattern in the noise. The noise function accepts X,Y,Z values for input parameters and produces a float between 0-1 as a result. Noise becomes more interesting if you scale down the input values. The return value is still between 0-1, but the output is more natural -- peaks and valleys of intensity. 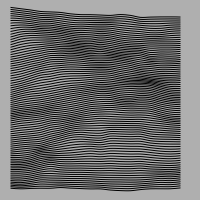 stroke( noise(x*0.015, y*0.015 ) * 255); // note that the input is scaled down. Here the "Z" input value is attached to the mouse Y position. The X and Y values are the same, but the Z changes. As you move the mouse, you'll see the noise function move smoothly. To store and retrieve the state of transformation (particularly for saving the default) use pushMatrix and popMatrix. To load external files into an applet, place your files in a "data" folder under the folder containing your PDE file. For security reasons, processing will not load files found elsewhere on your system. For this reason, you will need to save your PDE file before running it. From the data folder, you can load images. Supported formats include JPG, PNG, TIFF, GIF, and TGA. Animated GIFs will only render the first frame. The PImage variable type contains your raw image data. You can use the loadImage() function to load the image data into a PImage variable. The image() function draws the image to the canvas. Pass the PImage variable to image() as the first argument. A PImage can be passed to the background() function instead of a color, but note that the image data needs to match the size of the canvas or an error will occur. The following example loads an image called miami1.jpg and draws it to the canvas. Images are rectangles, but you may use formats with transparent backgrounds for non-rectalinear shapes. Formats that support transparency include PNG, TIFF, TGA and GIF. PNGs should be your favored format for this purpose unless you need to use a different format for a specific reason. 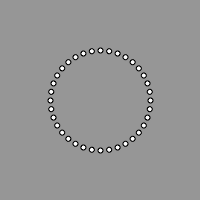 This example loads an image called dot.png, draws one to the center of the stage, and then draws another animated copy over it. Processing has added support for SVG, a vector file format. The workflow for adding an SVG to your applet is the almost the same as adding an image. Vectors require a PShape variable to hold the drawing data instead of a PImage. The loadShape() function will load SVG data into your PShape variable and the shape() function draws the shape to the canvas. Processing does not currently support gradients or SVG filters in your SVG data. The value of using vector data is the ability to scale without loosing image quality. For comparison, click here to see the same animation completed with a png image. The example below loads an SVG file called face.svg. SVG file can easily be created in Adobe Illustrator. Here is the original drawing in illustrator. Processing is somewhat quirky when it comes to drawing text to the screen, but it's not a difficult task. First you will need a VLW formatted font file. Rather than use the vector information found in traditional true type or postscript font files, Processing needs an image based font. The VLW font contains the characters of a font, pre-rendered as bitmap data. The VLW file needs to be placed in a data folder under your saved sketch. To create a VLW font file, choose 'Create Font...' under the 'Tools' menu in processing. The 'Create Font' dialog box is very straight forward. Choose the font you want to use, determine the size you want to use and click 'OK'. NOTE: Once you click 'OK', it may take a couple of minutes to create your rendered font file and the dialog box may look like it has crashed. Just let it run a few minutes. Each character is being rasterized, and depending on the speed of your system, this could take few minutes. Once you have a VLW file created, you will need a PFont variable to hold the font data. Use the loadFont() function to retrieve your VLW file, and use the textFont() function to set the font and size. The text() function draws the text to the canvas. The textFont() function works similarly as setting the fill color. You are setting the drawing style for processing to use for all the following text() function calls until you change the style. If you include a second argument for textFont() you can change the size from the default size in which the font was created to any size you want. Keep in mind, however, that the font will look best at the size it was created. You may notice that the smaller font in the example below does not look as sharp (particularly the lower case 'e'). 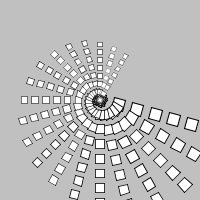 Create an applet in processing in which multiple copies of the same item (or very similar copies) combine to create a visual field or effect. The applet should take advantage of functions. It can be animated or interactive.